Add a Mediterranean feel to your landscape with Provence French Lavender. This Lavender is the variety treasured in Provence, France for its look as well as fragrance. Provence Lavender is widely used to make oil and sachets with its heady scented blooms. Provence French Lavender offers a bountiful harvest of edible, light lavender-purple flowers. The aromatic silver-green foliage is thin-leaved and adds lovely color and texture to your landscape. Lavender attracts butterflies and hummingbirds! Get outside and enjoy nature and the intoxicating scent of Provence French Lavender in your own backyard! Provence French Lavender thrives in full to part sun and dry climates. Lavender is adaptable to any well-draining soil. This hardy variety is able to tolerate sandy and salt conditions and is deer and rabbit tolerant. Fertilize in spring when you start to see your lavender emerging from dormancy. Transport yourself to the sights and scents of France with Provence Lavender. Order yours today! Provence Lavender thrives in full to part sun and dry climates. Lavender adapts to any well-draining soil. This hardy variety is able to tolerate sandy, rocky, and salt conditions and is deer and rabbit tolerant. Provence Lavender is heat and cold tolerant and once established it is very drought tolerant. Be sure to provide plenty of room for your lavender to grow so there is proper air circulation. Avoid overhead watering. This provides an ideal climate for fungus to grow causing problems including death for your lavender. Fertilize in spring when you start to see your new growth. We do not recommend planting Provence Lavender in humid climates. Provence French Lavender is beautiful in the landscape. It makes an attractive border or groundcover. For major impact and luxurious beauty, plant this lavender in mass. Plant in a mixed bed to provide contrast to other perennials and shrubs. This Lavender performs well in a planter. Just be sure the container drains well. Great for an herb or cutting garden, this lavender can be enjoyed fresh or dried. Most orders and all supplies are processed and shipped the same day. 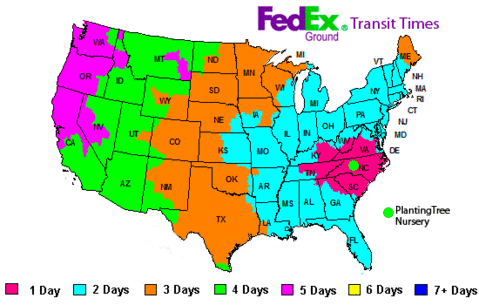 We plan each shipment to avoid your plants sitting in a truck over the weekend if possible. This means your order may be held until the following Monday to ensure the shortest delivery time. This delay will guarantee that your plants arrive the highest quality possible. Plants that specify shipping at different seasons will be shipped when they become available. ex. ships spring. Planted these last year and they were amazing. Just getting more now for my friend. I just love lavender.